Yesterday a Twitter user by the name of Ktr4ks posted a video of what appears to be a hacked version of Sonic The Hedgehog 2 starring Yoshi, everyone’s favorite disposable dinosaur buddy. Ktr4ks even posted a direct link to download the game and play it yourself, assuming you have a Sega Genesis emulation program to run the file. It turns out, Yoshi In Sonic The Hedgehog 2, as the title screen calls the game when you boot it up, was created back in 2010 by a ROM hacker known as Xenowhirl, whose other work includes Sonic 1: Bouncy Edition, where it’s just the original Sonic The Hedgehog but Sonic is constantly bouncing. Twitter user amphobius pointed out the hack, which is labeled within the game as “unfinished,” was likely a leaked copy of a work in progress that was created for and submitted to the 2010 Sonic The Hedgehog Hacking Contest. It wasn’t made publicly available at the time, and its recent release comes seemingly at random. 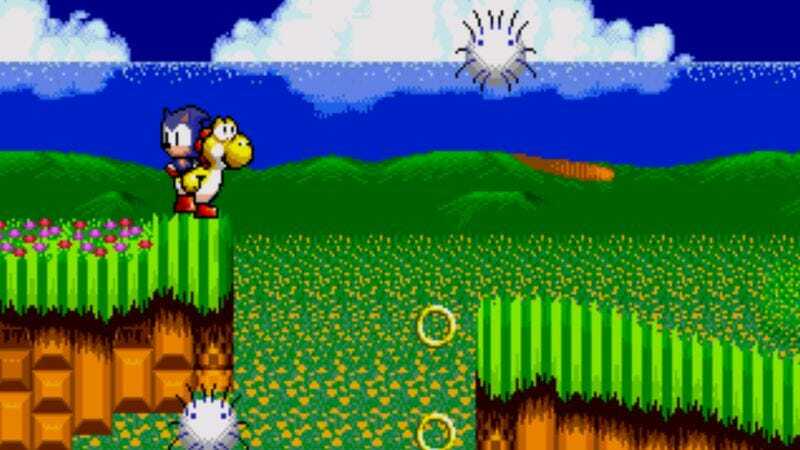 The hack itself lets you play as Yoshi in Sonic 2’s levels and take advantage of all the abilities the dino had in Yoshi’s Island. Sonic is still there, but he’s been relegated to the baby role Mario played in that Super NES classic. If Yoshi takes any damage, Baby Sonic will float away in a bubble, and if you can’t grab him before Metal Sonic zooms across the screen and snatches him up, you lose a life. It works surprisingly well. Yoshi’s fluttery jump makes Sonic’s sometimes unwieldy platforming much easier to deal with and perfectly fits the big, multipath design of Sonic levels. Xenowhirl even added in a few superfluous Yoshi’s Island touches, like flowers to collect and Fuzzies to get dizzy from touching. One player mentioned it’s impossible to get past the fourth-level boss, which seems plausible given the hack’s “unfinished” status. (Full disclosure: We couldn’t verify this because we got up to Chemical Plant Zone Act 2, were reminded of how infuriating that level is, and turned the thing off before we were forced to break anything.) Still, it’s a well-made ROM hack and a pretty novel experience while it lasts.